One of the most celebrated writers of the Indian subcontinent; Prem Chand died on 8th October 1936 and has since been studied both in India as one of the greatest writers of the century. Born as Dhanpat Rai on 31st Julu 1880 in Lamhi, Varansi, he started his early education at Madrasa where he learned Urdu and Persian language. Later, he was sent to a missionary school where he learned English. Dhanpat Rai began writing under the pen name “Nawab Rai”, but subsequently switched to Prem Chand. A novel writer, story writer and dramatist, he has been referred to as the “Upanyas Samrat” by some Hindi writers. His works include more than a dozen novels, three hundred short stories, and many plays and translations. Premchand’s some popular works are Godan, Karmabhumi, Rangbhumi, Ghaban etc. 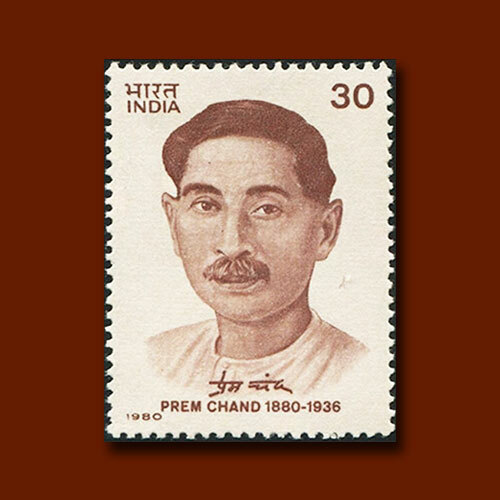 In 1980 India post issued commemorative postage stamp to honoring Prem Chand.